Ask the Professor is a safe forum for kids to interact with the cartoon character. 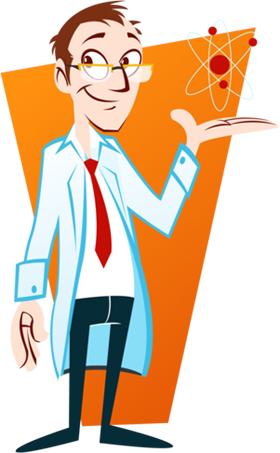 The Professor selects topics and answers questions related to science and technology. He doesn't answer questions related to homework assignments or direct comments to any one individual or school. In general terms, the Professor promotes creativity and encourages students to learn by doing and by exploration. He encourages hobbies of all kinds, especially those that require patience in acquiring skills and achieving goals. Parents and teachers will find the Professor's answers supportive of their efforts to educate and cultivate healthy attitudes. He reminds young people that they are tomorrow's future and why learning science and math is important to innovation. Inventions, he teaches, are simply improvements on existing ideas. The "Professor's Blog", like all of our forums and social media pages, are moderated to protect young people from inappropriate content or postings. Personal contact information, including phone numbers, e-mail addresses and links to social media pages are not allowed. Thank you for teaching me and my friends so much. Although it has been months since I attended your lab, my mind cannot seem to turn off all the amazing things you taught me. My question relates to the experiment where we dropped a magnet down a copper tube and it slowly floated down instead of just dropping. You said this was a great way to see how sunlight works in slow motion. Can you explain again how it works and do you have any good ways to show me how light works? You ask good questions. I do. Remember we are talking about the invisible forces of electricity and magnetism. They are like twins and cannot exist without one another. When electrons are on the move magnetism is sure to follow. When we dropped the magnet down the copper pipe it created a very large electrical current in the portion of the tube ahead of where the magnet was falling. Copper is a good conductor of electricity. If the pipe was plastic the magnet would have drooped like a rock. A thinner pipe would not create as powerful of a magnetic field so the magnet would drop much faster. This is because a thinner pipe isn’t as good of a conductor of electricity. The bigger pipe has more atoms. Electric currents always make temporary magnets and it was this new electromagnet field that opposed the fall of the magnet we dropped. So magnets make electricity and electricity makes magnets. This is electromagnetism and how all the energy in the universe is carried through space. Remember that our eyes only see a tiny portion of these waves or exchanges of electricity magnetism. Our cellphones transmit light also. This light can travel through walls but our eyes cannot see them. But the antenna of the cell towers can. Their eyes can see in the dark. I found a YouTube video that shows how these waves travel through space and recreate each other much like the falling magnet. The video is about light polarization. It does a great job in showing how electricity and magnetism are 90 degrees apart as they travel and recreate each other through space. They are 90 degrees apart in wires as well. This is why special cables are required for cable TV. It is a little complicated, but do not let this confuse or scare you. You already know more than most adults. I hope this helps. Remember, the only dumb question is the one you are afraid to ask. I hope this helps. Keep in touch and let me know how you are doing. Be sure to share this post with your mom and dad. They will be equally proud of you.